Gratitude: A Prayer and Praise Coloring Journal invites you to bring creative journaling and the calming act of coloring into your quiet time with God. This beautifully designed interactive prayer book from Tyndale’s Living Expressions collection helps guide your thoughts as you pray about concerns such as health, overcoming stress, personal relationships, and more.Gratitude gives you a way to celebrate and give thanks to God for the many blessings he provides. 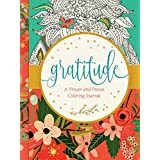 Filled with over 100 designs to color, plenty of space for journaling and sketching, and 40 needs-based prayers, Gratitude helps you express your devotion to God with your whole heart! I have started doing something I thought I would never do again. I started coloring and I love it. Oh I've tried to color when it became a new thing for adults but it just stressed me out. Yes, something that was supposed to relieve stress actually caused it! I would start on those big pages and just worry about getting it done, how it looked, and then think I'm wasting time. I thought I should be doing something more productive. This past week all that changed when I was sent Gratitude: A Prayer and Praise Coloring book from Tyndale House publishers. Believe me it's been a whole different story. Each page is uplifting and I feel good about spending time in this book. As you can see I couldn't find my colored pencils so I just started using crayons that the grand kids have. The first page I started actually took me three days and I didn't care. I loved reading the verse everyday and feel like now it resides in my mind to remember when needed. Such a great verse: God Loves You and Has Chosen You 1 Thessalonians 1:4. Each page has an uplifting thought, sometimes a prayer or sometimes a verse, to help you with the time spent with God. I loved the gentle ways it inspires you to remember your loved ones in prayer and to be thankful. Wonderful coloring book. I've now found my colored pencils and I'm having a great time! I was sent this book from Tyndale House publishers in exchange for an honest review.